Striker Simon Church has turned down a contract offer from Hibs. 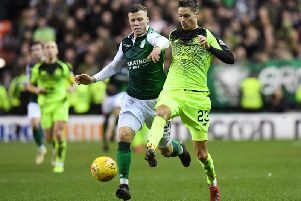 The 28-year-old forward, capped 38 times by Wales, was on trial with the Easter Road club last week as Hibs head coach Neil Lennon attempts to bolster his strike-force. Free agent Church did enough to impress Lennon, with Hibs keen to agree terms with the former Reading hitman, but the Welshman revealed that the deal was not good enough to relocate his family from Berkshire to the Capital. “Hibernian offered me a deal, but it’s not quite right for us in terms of moving the family up to Scotland,” Church told BBC Radio Wales. “It’s not ideal [to be without a club] because clubs are well into their pre-season schedules and signing players. “But I’m keeping on top of my fitness and I’m hopeful something will come up.